All lovers of fishing are eventually drawn to salmon fishing for the sheer challenge. Salmon do not find their way to the rivers to eat, and once they find freshwater, they live off their existing energy reserves. They do not need food, so they can be a difficult fish to catch, especially for beginners. Fishing for salmon is, therefore, a different experience and needs some tips and tricks to master. The more experienced anglers even enter salmon fishing competitions which exist the world over. There are many different ways to fish salmon too, from multiple lines on a boat, to fly fishing alone or in groups. Float fishing and trolling are the ultimate choices for a relaxing fishing trip on a lake. Those in search of the spawning fish in the streams and rivers will stand the best chance of enticing a bite with the use of egg sacks. 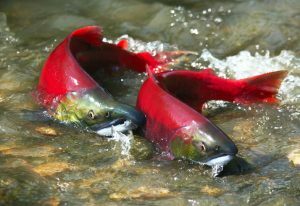 Whichever you choose, salmon fishing is an opportunity to enjoy the excitement of the sport in the beauty of nature. Salmon are sleek and powerful, often called the King of fish, and renowned for their sporting qualities. The name covers several varieties of fish from the Salmonidae family, all of which are born in fresh water. They later migrate down to the sea where they will mature into adults. Salmon, therefore, have some fascinating and unique adaptations. These allow them to survive in both freshwater and saltwater, which is not normally possible for fish. They can travel for huge distances over their lifetime, searching for feeding grounds at sea, and then returning to the rivers to reproduce. With exceptional navigation skills, they are known to find their way home to the specific place of their birth. There are two main types of salmon, named after the oceans they inhabit: the Atlantic and Pacific. Usually a light colour in the sea, their bodies turn the familiar red when it is time to spawn. They are highly prized by the avid fisherman, who will travel long distances when there are plenty of fish in the river spawning, for the challenge of a bite. The salmon fishing season starts in January and lasts until November. Usually late spring and autumn are the best, but many rivers can be fished during the summer too. Scotland is probably one of the premier countries for Atlantic salmon and Canada for the Pacific salmon, but you can fish everywhere from Ireland to Alaska. Not only can you enjoy world-class angling, but you can enjoy the other attractions of the country and make a holiday of it with avionero.com. There is a host of culture to enjoy along with salmon fishing too. For instance, the Pacific salmon have been significant in religions and economies for millennia. Historically, salmon has been an important part of the Native American culture and they appear in many Pictish stone carvings. They were also critical to the development of the Canadian economy. You can literally follow the fascinating life of this fish around the world.